The 1870s and early 1880s were years of rapid development for baseball. As professional baseball become more popular, its organization began to take shape. And after some serious injuries, mitts and helmits began to appear. 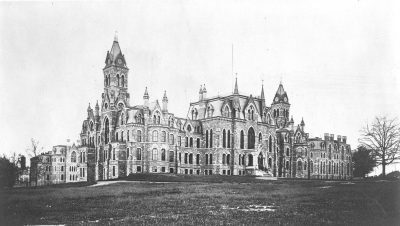 At the time of the University of Pennsylvania’s 1872 move to its West Philadelphia campus, college athletics, including intercollegiate sports, were only beginning to take shape on American college campuses. Interested student athletes were still just trying in any way possible to engage in sports they enjoyed. The University’s move to West Philadelphia came at the right moment, laying the groundwork for expansion not just of the campus but also of curriculum, student body and athletics. 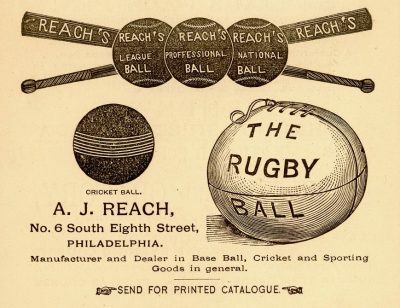 During the first dozen years in West Philadelphia, Penn baseball developed in fits and spurts so that, after 1884, baseball would emerge as a regular sport at the University. During the first decade after the move to West Philadelphia, the teams organized by individual undergraduate classes, professional schools, and student organizations continued to be the most visible baseball teams on campus. The yearbooks from this era often emphasized class teams more than the University teams. The yearbooks from 1873 on usually listed members of the undergraduate class teams as well as varsity teams; sometimes the narrative accounts emphasized class teams far more than varsity teams. For example, the 1872 Record is the first yearbook to provide details about Penn’s teams. Listed here are members of sophomore and senior class teams, the Zeta Psi fraternity team, as well as the “University Nine” (known as the “Varsity” team by the end of the century). The Zeta Psi team defeated a team from Delta Psi in the fall and teams of Blockley Almshouse doctors and the Germantown B.B.C. team in the spring; their only recorded loss was to Haverford College. The 1873 Record lists members of six teams: one for each undergraduate class and for Phi Kappa Epsilon fraternity, as well as for the “College Nine.” All that is known of the games played is that the Senior team defeated the College Nine on September 27th, 1872, and that in the spring the sophomores were defeated by the freshmen and by a team from Episcopal Academy. At least as early as 1881, it had become a tradition for each class baseball team to play the other three class teams and sometimes a team from the Medical School, with the team winning the most matches being declared the champion. In 1884, three days before the first game, the University Magazine reported: “Baseball is very popular this spring. Nearly all the classes have teams. The play is improving, as the scores show. The class championship games will probably be played out.” Class rivalry would continue to express itself on the baseball field throughout the rest of the nineteenth century. In the early years, the University team consisted of nine players, although substitutes appeared in 1875 and in a few of the next years. Throughout the 1870s and 1880s, leadership and management of the team was entirely a student affair; team members appear to have elected their captain, and there were no coaches or trainers. Managers can be documented for the University Nine as early as 1879; they were responsible not just for for caring for the team equipment, but also for for raising and managing the money needed to equip the team, and arranging the schedule of opponents and playing fields for games. From 1872 through 1900, the University Nine drew its members from both the undergraduate classes of the College and also from Penn’s thriving professional schools; the only exception was the 1873 team, referred to by the 1873 yearbook as the “College Nine” because players were undergraduates in the College. This practice might seem questionable now, but it made sense at the time. Because a bachelor’s degree was not required for admission into medical, law or dental school, students in these schools were younger than they are today, close in age to students in the College. Because its professional schools were such a significant part of the University, sports enthusiasts at Penn had compelling reason to seek athletes from these schools. Penn’s professional schools had long attracted more students than did the College, but as the nineteenth century progressed and as undergraduate enrollment increased, the number of professional students grew even more rapidly. Since enrollment in the professional schools was significantly higher than that of the College, the schools of medicine, law, dentistry and veterinary medicine offered a large and attractive pool of potential players. 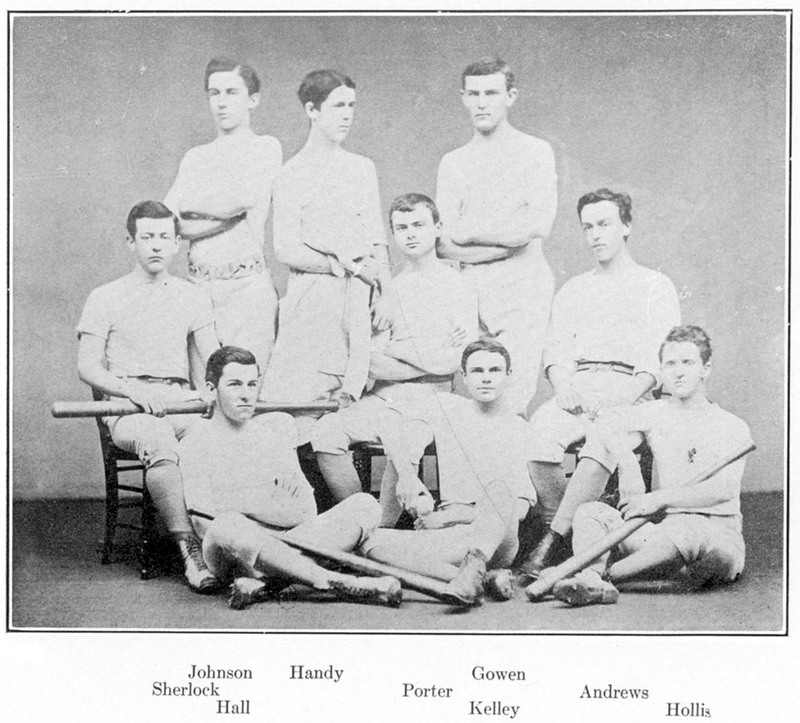 The June 1879 issue of the University Magazine recognized this situation when it asked: “Why does Penn not have a better baseball nine?” The writer suggested: “We must not look for good players only in the Arts and Scientific departments, as has been the case in former years, but we must extend our observations among the Law, Medical, and Dental students.” This option was only partly explored in the early going, as the teams from 1877 to 1884 contained, at best, two or three men from these schools, but the proportion of professional school students on the varsity team would increase during the last fifteen years of the century. Intercollegiate play was established very slowly, even after the formation of the University Nine. The earliest surviving documentation of a Penn game with another college or university comes from the fall of 1874. This season Penn’s University Nine played not only four games with the Medical School, but also five games with opponents from outside the University, including Swarthmore College, the Germantown Juniors, and an all-star team made up of players at various Philadelphia colleges (known as the “Picked 9 of Philadelphia”). At the season’s end, the University Nine held a very respectable record (5-3), but only the Swarthmore game qualifies as intercollegiate. There is only one other recorded intercollegiate game before 1882. When Penn’s University Nine again played outside teams in the spring and fall of 1876, the opponents included secondary schools and private clubs rather than other colleges or universities. The second recorded intercollegiate game occurred during the 1878-1879 season when Penn traveled to Princeton to suffer a 21-8 defeat. Then, during the early 1880s, baseball almost disappeared from the Penn campus. A few intercollegiate games were played, but some years there was not even enough support to pull together a team. It was not until 1885 that the University Nine have enough resources to begin developing a reliable intercollegiate program. Despite this interest, there were a number of difficulties hindering the development of intercollegiate baseball. First, each fall season baseball had to compete with cricket and football, which was now emerging as a major sport. There was also the problem of financing; the student manager of the team often had difficulty raising the money to pay for uniforms, bats, bases and transportation. And of course, there was still no proper athletic field on campus. Students recognized the problems and explored various organizational solutions. Until 1882, the difficulties faced by both class clubs and the University Nine fell under the domain of the students’ Baseball Club. This group made some progress when, in 1880, it reorganized as the “Base Ball Association,” with a Board of Directors consisting of representatives from various schools of the University. This board was responsible for the election of officers and the appointment of two committees. One committee’s job was to select a baseball nine, while the other committee was to seek contributions whose proceeds would go towards supporting the nine during the season. 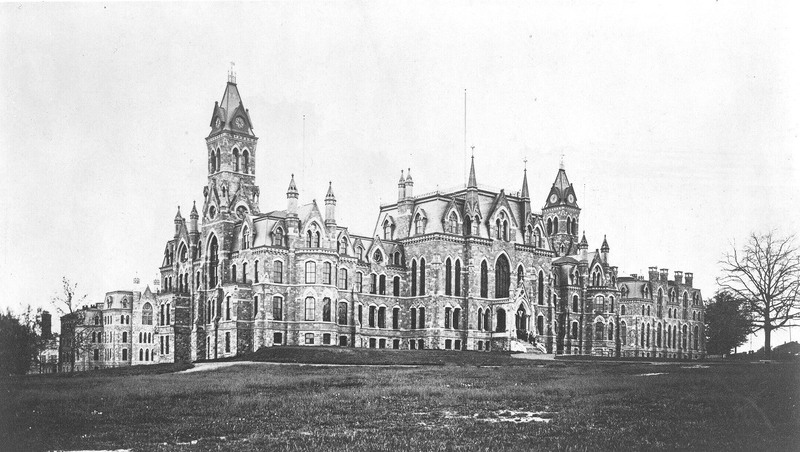 With this new structure under control and in effect, Penn did organize a University Nine in 1880. This was a step in the right direction, but the fact that no University Nine was formed the following year (1881) demonstrated the need for a broader solution. The next effort came from another campus organization, the University of Pennsylvania Athletic Association, formed by students in 1873 and then reorganized to include considerable alumni involvement of alumni in 1882. The alumni brought with them their enthusiasm for baseball, the possibility of continuity of leadership and of course, deeper pockets to help with the purchase of uniforms and equipment. During the 1882 season, the University Nine was resurrected, their games limited to the spring season only. Penn played Rutgers and Lafayette in three intercollegiate games, more than the one intercollegiate game played in 1879; but the University Nine lost two of these three games and in the following year again failed to play any intercollegiate game. This setback was probably related to a lack of financial resources; the September 20, 1882 issue of the University Magazine reported that Penn’s University Nine had a debt of $60, with $36 of it due to the Lafayette Base Ball Association. The April 5, 1883 issue contains an article describing the Athletic Association’s withdrawal of support for the baseball team and requesting support from Penn’s students. Evidently, reorganization at the top of Penn’s Athletic Association was still not sufficient to jump start the varsity baseball team. Under the auspices of the newly-reorganized Athletic Association, a new Baseball Association was formed in 1884; its officers, board and managers would be responsible for both the University Nine and the class teams for the next several years. In the spring of 1884, the University Nine again functioned, losing the one intercollegiate game to Rutgers, but winning the game with the Young America Club. Both games were away; Penn still struggled with the lack of a playing fields. Penn baseball was starting to put the pieces in place for a successful intercollegiate sports program. The opening of Penn’s own athletic field in the spring of 1885 would initiate a new emphasis on intercollegiate sports at the University. As the role of both alumni and the University administration increased, Penn varsity teams would grow and prosper. In the coming seasons, the University Nine would see a steady increase in the number of their intercollegiate games and an improvement in their record.